AEROS GYRO – parafoil kite with open cells. New AEROS Gyro obtained totally new airfoil, new plan form, improved internal wing design. As a result – depower, handling and stability were significantly improved, handling became smooth and pleasant. Due to innovative design solutions wing became lighter. Open cells with rigid ribs noses provide easy take off and parking in any reasonable wind conditions, increase safety in the mountains. 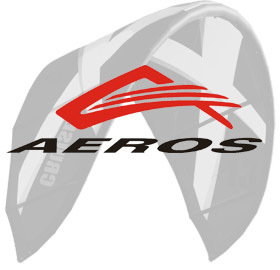 For whom is Aeros Gyro designed: GYRO will suit for weekend riders, for admirers of mountain snowkiting, for those, who prefer comfort and safety. New AEROS Gyro has one-front line release system which shows great results – immediate and constant load dropping untill kite parking. We made hundreds of experiments with such release and can say that it works superb. Same as previous year we propose AEROS Gyro both in standard edition and in Open Air Edition. OA kites have reinforced canopy structure, stronger suspension and main flying lines, additionally secured pulleys, 3-rings release system. AEROS Gyro OA is perfect both for mountain riders and for admires of autonomous snowkiting. AEROS Gyro OA is available in 10 sqm and 12.5 sqm.